One of the other few highlights of the recent VGX video game awards (another being the announcement of new Game of Thrones and Borderlands video games from Telltale) came in the form of a very intriguing and unbelievably ambitious new video game announcement. The game is titled No Man’s Sky, and it looks to offer the ultimate exploration experience. If you asked all geeks what their dream video game would be, many of them would likely answer with “an open-world space exploration game.” Open-world games today are great—huge maps you’re free to explore for hundreds of hours—but they always do have an end to where you can go. But what if, in a game like Skyrim for example, instead of saying “I want to go to the top of that mountain!” and making your way to that destination, you looked up into the night skies, saw a planet, and decided you wanted to jump into your dragon space ship and go and explore there for a while? That’s the idea we’re dealing with here. Told ya…ambitious! But it gets better. 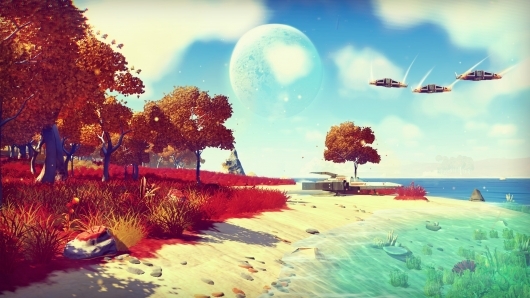 Click on over to the other side for more and to see the first trailer for No Man’s Sky. The game is being made by Hello Games (who made the Joe Danger games, believe it or not), and it’s very difficult to put into words what they’re trying to pull off. And even harder to believe. And so the idea starts to come together. It’s not a particularly small idea. In fact, you could probably call it the Last Great Science Fiction Video Game Pitch: a procedural universe for you to bomb around inside, making discoveries and getting into scrapes. Downed ships, space battles in asteroid fields, giant worms cruising through the sands of some backwater hellhole – these are cliches for sure, but that’s the whole point. They’re the best cliches the genre can offer, and for once they’re all connected, linked together, obeying the same handful of rules and first principles, and all the more alive because of it. Imagine an Elite with the power to take you down onto the surface of planets so you could explore the terrain. Imagine an Elite where you can use your blasters to drill a hole through an asteroid and see what’s inside. A “skybox,” for those who were curious, is basically what makes video game worlds feel like real worlds. All of the things around you—the sky and moon and stars, or distant buildings and mountains and so on—that are unreachable but help to create a sense of scale and depth so you feel like you’re in a real place and could travel to those things if possible. No skybox, everything should be accessible. All of this is mind blowing stuff, and hard to believe. But not unbelievable. What makes it all unbelievable? The team at Hello Games working on No Man’s Sky consists of only four people at the moment. FOUR PEOPLE. Let that sink in. With how unfathomably big this game is being made to sound and how little the team is working on it, it’s hard not to think this is something we’re never going to get to play. But here’s a trailer, and that’s a step forward. From this point on I for one will be crossing all digits in hopes of one day getting to step into this universe.